Dear community, ye creatives, visionaries, revellers and mischief makers! It’s getting close to that time again when we start to collaboratively form the basis of our Beltane Fire Festival. This year is particularly special, as we celebrate the 30th Anniversary of our Beltane: a chance to reflect upon and celebrate this unique and incredible festival! To begin this process, we would like to invite submission of Group Organiser applications. We are looking once more for a band of intrepid volunteer Group Organisers to help tell our story of Beltane. As a GO, your role will involve developing your story and key moments, in close collaboration with the Beltane Court and Blues (this year, with specific thought given to the 30th Anniversary); recruiting and managing volunteers; making props and costumes; choreographing your activity, music or rhythms; and contributing to the combined body and voice of our event. In return, we can offer you an amazing experience, during which you’ll learn new skills, meet new people, and make a difference to others by helping them on their journey to celebrate the start of Summer. To help guide and shape your ideas, the below will present an outline of the processional narrative of our ritual celebration, a story told in one form or another by hundreds of volunteers over the years, since we began in 1988 (did we mention it’ll be our 30th?). We also set out suggestions for some performance groups that we’d love to see make an appearance, and production groups that are also vital to existence of our festival. The groups mentioned below are ones that have all been part of the event before, but there is always scope for fresh interpretations of those groups, as well as completely new and different concepts to be introduced. Bring your creativity and your unique vision to help us build something incredible together! Please read through the following information carefully, and then download the Application Form, Example Application Form and Guidance Information, linked at the end of this post. The deadline for Group Organiser applications is 10pm on Thursday 2 February 2017. There will be a pre-application meeting for prospective GOs from 2pm-5pm on Sunday 22nd January 2017 at the Canon’s Gait pub. This will be a working meeting with structured discussion. If you would like to come and hang out socially, please feel free to come along afterwards, but we ask that only prospective Group Organisers attend the meeting itself. You can find more information in this post and are welcome to register your attendance on the Facebook Event page. If you’re thinking of applying to run a group but you can’t make it along to the meeting, please get in touch with the Blues at blues[at]beltane[dot]org and/or the Board of Trustees via festival[at]beltane[dot]org to share your ideas, as they’re happy to hear from you before applications start arriving. At its core, this sequence of events sees the May Queen rise from the Earth and reveal Herself in Her maiden aspect. Anna Chaney will be returning in the role of May Queen for Beltane 2017, and will be sharing her thoughts in an upcoming blog post. She is accompanied by Her former consort, the Winter King (or Horned God), who has become old and decrepit before his journey toward rebirth as the Green Man. The May Queen must make a choice to travel through the Fire Arch, the door between the worlds, and catalyse the turn of the wheel; a process necessitating the sacrifice of the old God, in order for Him to be reborn anew. Along the way the May Queen passes through the elemental points, awakening each one as She goes and gathering their energies. She is accompanied on this journey by the Whites, who represent an extension of Her maidenhood and an outward expression of Her new fertility and strong maternal nature. The procession encounters many characters, which have appeared in many different manifestations over the years. One of these groups has been the Reds, who are extensions of the Green Man and offer a contrasting energy to the Whites. During this elemental journey, the Reds are birthed and, as they explore their new bodies and the world they find themselves in, their energy grows in strength. Upon the awakening of the Fire element, the passion and vigour within the Reds overcomes them; attracted to the Divine light of the May Queen and the beauty of the Whites, they launch themselves at the procession. The chaotic flow of their charge threatens the momentum of the processional ritual and so their advance is fought back: they are repelled, running off to gather their energies anew. The Reds make one more stunning display to entrance the witnesses and pique the interest of the Whites, but once again are repelled and recoil once more into the night. Thus, the procession moves into the centrepiece of our ritual: the sacrifice and rebirth of the Green Man. The May Queen, having gathered the many elemental forces around the Hill, spins them into a vortex, making right the conditions for the Green Man’s return. Witnessed by both our own community and the wider community, this powerful death and rebirth sequence binds us together in our hope and desire for renewal. The Green Man presents himself to his Queen – if He is worthy, She will accept Him as Her new consort. The first responsibility for the newly joined God and Goddess is to complete the journey of the Neid Fire and spark the bonfire, bringing light and warmth to the Hill and often seen as symbolising the marrying of the community. They then lead their court to the Bower, the hearth of the Hill, as the Reds continue their revelry around the newly lit fire. At the Bower the ritual comes to a close, but not before the Reds and Whites have concluded their seduction, both accepting one another as their King and Queen have done. The only thing left to do from here is to dance and revel in the joy of the newborn Summer, as we invite our witnesses to dance with us. Sparking with unbound, chaotic energy needing to unleash towards the procession, witnesses and Hill, this is a high commitment group and core to the processional narrative. Newly birthed into the world on the night, they are awed by what they have been awakened to; every little detail is a thing to be explored, tested, tasted, clambered on, or similarly conquered. These innocently mischievous newborn beings know no boundaries and so they are free to whirl and dance and express themselves in whatever fashion pleases them. The Whites are extensions of the May Queen and embody inner strength, serenity and focus. Another high commitment group, core to the processional narrative, they express as creative and intuitive spirits. Unlike the Reds, they are aware of their purpose and fulfill their obligations towards the Court, before responding to the insistent whispers of their own desires. The Whites know that their energy is equally as fierce as that of the Reds, but they bend it towards powerfully protecting and shielding the procession and the ritual from the unbound chaos of the Reds. Once the May Queen and Her consort present their courtship at the bonfire, the Whites freely and gladly choose to dance with the Reds, extending the union of the God and Goddess into the community. As the May Queen wends Her way around the Hill, She must renew and be rejuvenated by the elemental forces, weaving each one into the alchemy of Her purpose. We would like to invite 4 separate groups to embody each elemental point of Air, Fire, Water and Earth. Each group is encouraged to create a performance around an elemental offering to the procession, as well as a second performance for the witnesses. Alternatively, this second performance may involve a joining of forces with other elemental groups, to create a bigger piece involving all four elements. 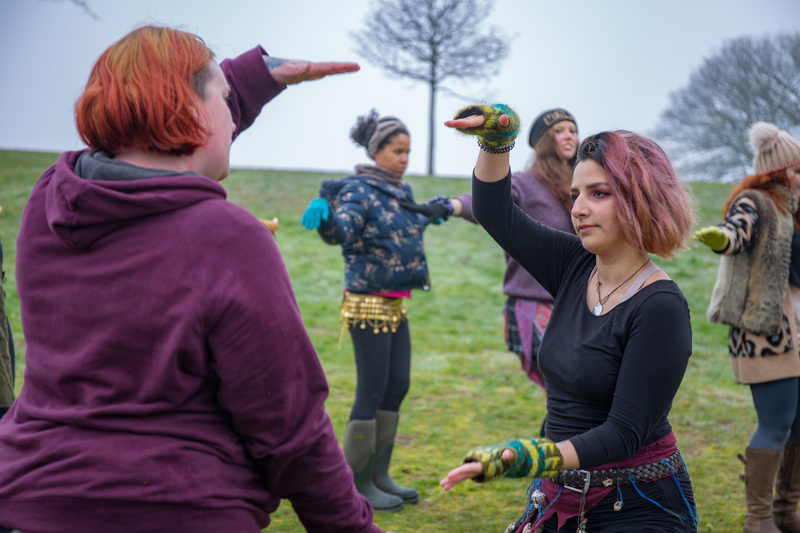 We encourage these groups to offer interpretations of the elements that contribute to the ritual, explore them, express them as BIG as you can, use the Hill in new and exciting ways, and let your imaginations run wild! Our procession is nothing without the pounding beats of our drum crews, the most common being the Beasties and the Processionals. 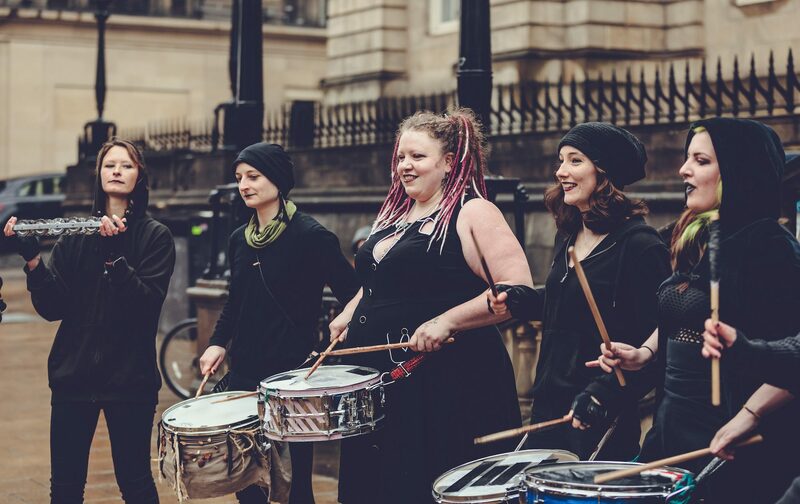 Be it the carnal chaotic Red heartbeat or the insistent and unstoppable rhythm of nature – or even a brand new drum group adding to the spirit of the night – we invite you to come forth and make us move! Our Torchbearers have always been an integral part of our ritual, adding ceremony and protection, as well as the creation of the sacred fire. They start the Neid Fire that sparks all other flame on the Hill, creating a liminal boundary between the outside world and witnesses, and those within the procession. Please come forth if you wish to embody this character…and carry fire on a stick! The home of our Hill, our community and the May Queen, the Bower is the space where the final ritual between Red and White is played out, a place of nourishment, safety, rest and joy. We’re calling for your vision to create this Sacred Hearth on the Hill, through creation of a magical space, and facilitation of this final aspect of our ritual, ending with a warm welcome extended to all – performers and witnesses alike. In the past, we’ve seen all manner of wonderful beasts, faeries, sprites and spirits, for example, No Point, The Faerie Porters, The Aerie, Random Points of Kindness, Storytellers and Bonfire Point, whose unique characters have all become part of our weaving narrative. They offer their own interpretation to the central story, creating stunning points of interest to light up the dark, fill the air with glorious sound and capture the imagination of all who encounter them. For groups who choose to have a presence outside of the procession, there is great scope to create more intimate and interactive experiences, inviting witnesses to feel a personal connection to the event and create memories of an incredible evening that they can carry off the Hill with them. 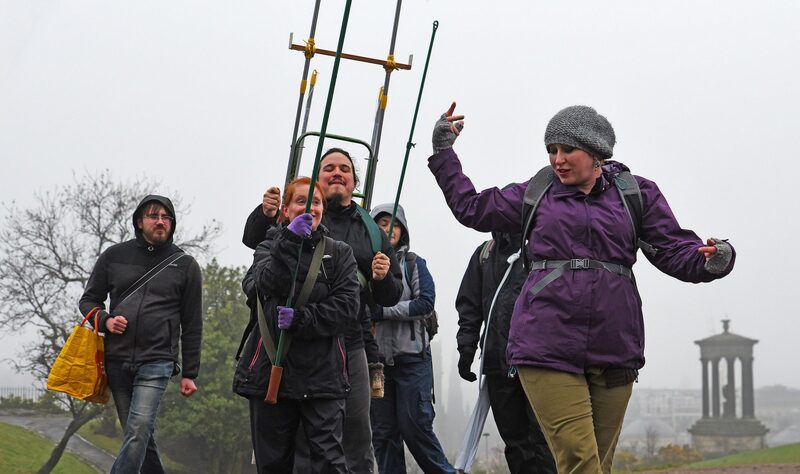 If you have a fantastic idea for a group like this, we encourage you to consider how you might use the available spaces within the landscape of the Hill, whether you will travel your own path, or adopt a static area for part/all of the night. Consider also how your core themes intertwine with the story being told, and how you will interact with the Court, the Blues, and the other groups on the night. These include…. the Stewards who facilitate the movement of performers around the Hill and dedicate their energy to the safety and happiness of all; Contact Point who offer information and guidance; Tech, responsible for the logistics, structures and safe but dramatic fire art that form the background and backbone of the event; and Photopoint, who capture our creations and memories in beautiful pictures. We are looking for Group Organisers to bring their dynamic personalities, as well as practical knowledge and experience, to build these important foundations, on which the rest of the event rests. These groups offer a different experience of the festival, providing an opportunity to participate in creating the event from a non-performance perspective, as well as learning and honing a range of professional skills. If you’re considering applying to run one of these groups, we encourage you to include amongst your GO team someone with relevant experience and/or skills, gained either inside or outwith BFS. Think about how you can run and develop a team of volunteers to work together with the Event Coordinator to create the well-oiled machine that powers the festival! Our community is bursting with creativity and imagination. If you are an experienced BFS festival participant, and have an idea that you would like to make a reality as part of the 2017 festival – but feel it doesn’t fit with a group structure, or necessarily require recruitment of additional volunteers, please email festival[at]Beltane[dot]org to request more information on how to submit a proposal. The deadline for submissions of proposals is Thursday the 2nd of February 2017 – email them to festival [at] Beltane [dot] org. Proposals will be granted at the discretion of the Board, and you may be invited for a short interview to discuss your idea. You are invited to take inspiration from the over-arching narrative of Beltane, the casting off of Winter’s darkness and revelling in the joy of a newly birthed Summer, from fertility and celebration. 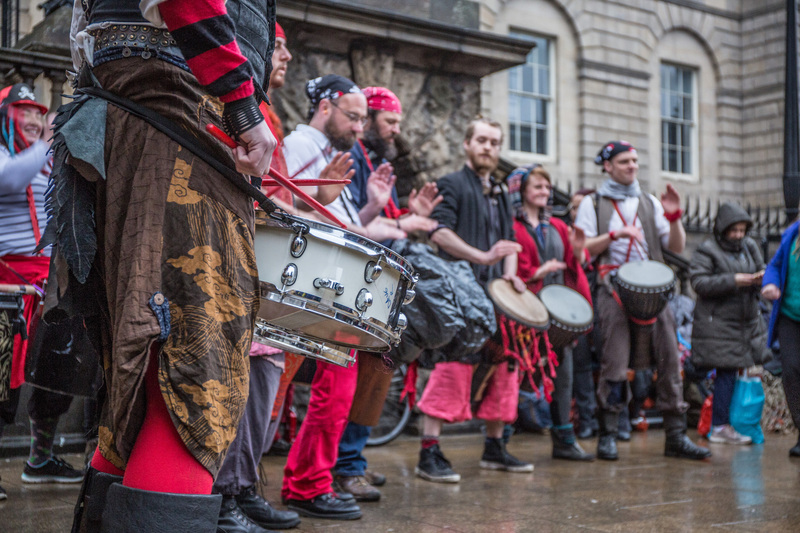 Let us make our Beltane a wild Bacchanalian rumpus to drive the community of Edinburgh wild! Bring your beautiful visions to the night!